Beatrice Buchanan has spent more years than she can remember distancing herself from everyone close to her. She has no relationship with her grandchildren, and the only time she speaks to her daughter is during her weekly fifteen-minute commute to the nail salon. When Bea meets Walter on a cruise she realizes there may be more to life than designer clothes and impressing the ladies at her country club. Plan Bea is the second book I have written, but my first novel. My good friend and neighbor lost his wife to Cancer a few years ago. About a year after she passed away he met and fell in love with another woman. At first, it was difficult for me to see him with her. But as their relationship developed I witnessed changes in him. He took up new hobbies and seemed happier than I ever saw him. Their relationship got me thinking about the power of second chance romance. Could falling in love allow a cold, stubborn, and selfish women open her heart back up to her family? Plan Bea is about a mother and daughter whose relationship was destroyed by secrets, lies, and misplaced blame. 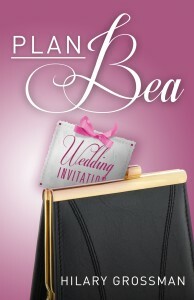 When the mother, Bea, falls in love again, she enlists her daughter, Annabel, to help plan her wedding. As the two women work together to plan the perfect affair, their relationship is tested further in this emotional and authentic story of redemption. “I’ll get it!” Violet yelled as she raced to the front door. Since I wasn’t expecting anyone I trailed behind her. My mother was waiting on the other side of the door. “You sure got your mother’s mouth, don’t you, darling,” Beatrice replied. “Yep! I do! I call ‘em how I see ‘em,” Violet answered, unfazed. “What are you doing home anyway? Shouldn’t you be in school?” Beatrice asked sounding annoyed more than concerned. “Strep!” Violet yelled before she ran back into the den to resume playing with Harley, who was also under the weather. What grandmother acted like this, I wondered. Connie had always been the complete opposite. I remembered the first time Violet got sick. She was six months old and had a fever of one hundred and three. I didn’t know what to do. Connie was the first person I called. She went to the pediatrician with me and then even slept over just in case we needed anything. She never worried about herself. She just wanted to help nurse her grandbabies back to health. I filled two cups and joined her at the kitchen table where she already had a stack of papers sitting. “I am trying to keep it under three hundred and fifty but that’s easier said than done. Between Walter and myself there are just so many people we have to include,” she answered before taking a sip of coffee. As soon as she swallowed her face puckered up as if I gave her poison. “I thought you said this was fresh, Annabel.” She dramatically moved her cup to the side. “No. I’m fine. Let’s just get down to business so you can continue about your day.” She handed the handwritten pages over to me, “Here’s my preliminary list. Walter has his own, of course. I didn’t bring that one. You won’t know anyone on it, I’m sure. But I did want to check if you or Cole wanted to include anyone I missed. After all, your mother doesn’t get married everyday!” She beamed. I scanned the names. On the bottom of the very last page, and written in a different color ink, clearly indicating an after-thought, were Cole’s parents and sister’s names. “Did you say something, Annabel?” She asked as her steel gray eyes peered into mine. “Is it safe to assume my kids are invited or would you prefer I find a random babysitter?” I asked. I didn’t reply. I knew my tone indicated my frustration, but really, was it such a far out question given how close my mother was to my children? “Slack Mother? Really? You’ve got to be kidding. What do you think I have been doing all these years?” I blurted out; instead of swallowing the words they came spilling out of my mouth. Speaking my mind was addictive. The more I did it the more I wanted to let out everything that has been troubling me for so long. “If that’s what you want to tell yourself, fine. But you know what? You can lie to others but you can’t lie to yourself. I’m not afraid to admit it; I know I made a lot of mistakes. I know I handled a lot of situations extremely poorly,” she said, as she made sure her caramel chignon was in place. “You can say that again,” I mumbled, a little louder than I planned to. “Yes, I know I did. And I’m not the only one. You have been far from perfect yourself.” She said pointedly. “What about it?” I asked, not sure where she was going. I swallowed hard but didn’t say anything. “I would even be able to accept it, but that wasn’t what happened, now was it?” Beatrice snarled. I took a deep breath, but remained quiet. “What are you getting at, Mother?” I asked as I pushed my cup of coffee away. I no longer had any interest in drinking it. My mind reeled. Could my mother have possibly known what really happened on the island? When I had told Connie my plan she tried to make me change my mind. She begged me to reconsider, in fact. But I was too stubborn. I didn’t want to heed her advice. She warned me I was playing with fire and I couldn’t keep the secret forever. I didn’t want to believe her. Who was I trying to fool? I think at the time I truly hoped my mother would learn the truth. Part of me wanted to hurt her just as much as she had hurt me. But now I am no longer dealing in hypotheticals and I felt sick to my stomach. I had secretly felt guilty about this decision for years. For so many reasons, guilt has been my constant companion.